Please, please, please DON’T peel off your gel polish. I know you might think that’ll speed up the process but it seriously damages your nails. You don’t want weak nails, do you? Avoid peeling! For anyone who’s ever tried to remove their own gel nail polish, you probably know just how long the process can be. You can’t do it in a rush! If you do, you’ll probably get annoyed and start ripping and tearing the gel polish off. That’ll ruin your nails! Make sure you have at least 45 minutes free before you start this process. Before you get out the acetone, file your nails first. The point of this isn’t necessarily for you to shape your nails, but to file the shine off your gel polish. Don’t file your nails too hard, though. A slow, gentle movement is key here. Remember, you’re not trying to file off all your gel polish — just the top layer. Be gentle! Acetone is very drying and if there was an effective way to remove gel nail polish WITHOUT using acetone, you’d be the first to know. Unfortunately, acetone is the way to go. Just make sure you’re protecting your hands before you dip them. Apply cuticle oil and maybe even some lotion to hopefully avoid your hands from drying out. There are a couple of different options here! Some people prefer dipping their hands in a bowl of acetone while some people like dipping cotton balls in acetone, placing them on their fingernails, and then using foil to hold everything together. Either option works. And while the second option seems more “professional,” it’s kind of tricky to do yourself. Which is why I’m a fan of simply dipping my fingers in a bowl of acetone and sitting there for 10-15 minutes. It’s up to you though. There are acetones out there specifically meant to remove gel nail polish. However, those can be a little pricy and you know what? You don’t need them. As long as your acetone bottle says “maximum strength” it’ll do the job. Save yourself a few dollars. Once you’re done soaking your nails, take a look at them. You should pretty much be able to tell if you need to continue soaking or not. 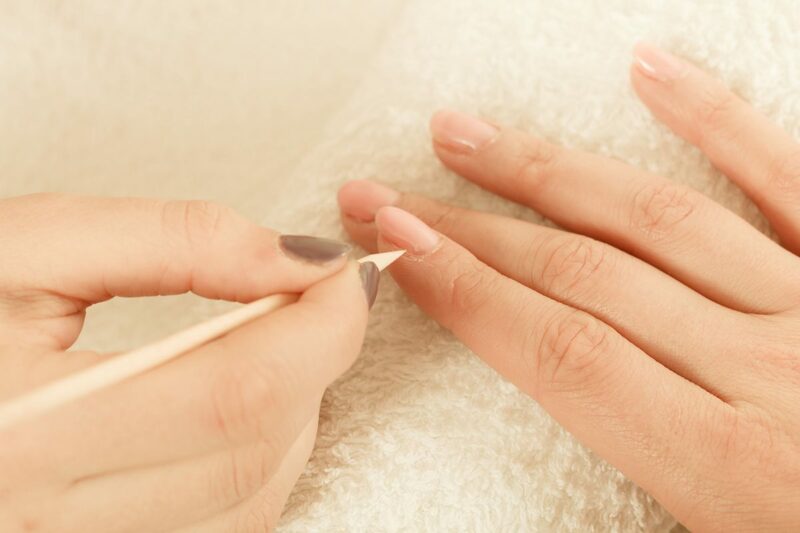 Apply a little pressure to your nails with a cotton ball or a nail stick. If your gel polish comes right off, you’re good. If it doesn’t, you probably need to continue soaking until the polish is looser. Who wants to smell acetone on their hands all day?! Not me! After you’re done soaking your nails, wash your hands thoroughly to remove the acetone and any leftover polish. After everything is said and done, you’re going to want to really focus on moisturizing your hands AND your nails. Use coconut oil, aloe vera, shea butter or another type of hydrating lotion. This is a crucial step in this removal process so please don’t forget it! You might also want to use cuticle oil to bring moisture back to your cuticles as well.